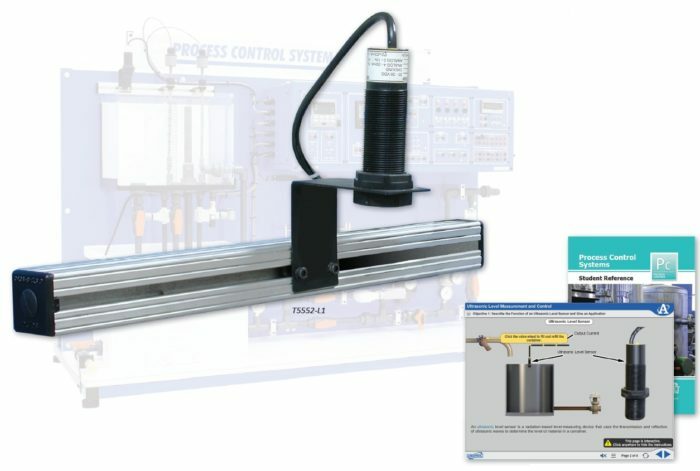 Amatrol’s Ultrasonic Liquid Level Learning System (T5552-L1) adds to the T5552 Process Control Learning System to determine the level of material in a container. Learning to wire and operate this type of sensor is a vital industry skill because it is safer to use in applications that use flammable liquids such as petroleum. Unlike a pressure type level sensor, an ultrasonic sensor does not directly contact the fluid, making its use inherently safer. The T5552-L1 attaches easily to the T5552 Level Flow Process Control System adding a powerful industrial-grade component to your training. This transducer conveniently mounts to an adjustable slide on the T5552-L1 workstation console above a process tank and is prewired to plug-in connections on the control panel for easy interface to controllers and display devices. The T5552-L1 includes an industrial quality transducer with 4-40 inch sensing range, built-in transmitter with 4-20 mA output, and student learning materials for theory and lab. This learning system also includes Amatrol’s world-class curriculum, which combines strong theoretical knowledge and concepts with hands-on skills for the best industrial competency- building on the market. This thorough, exceptionally detailed curriculum is built to begin with the basics and steadily advance to more complex concepts and skill. Amatrol’s peerless interactive multimedia curriculum utilizes text with voiceovers, pictures, videos, stunning 3D animations, and interactive quizzes and reviews that engage learners in theoretical knowledge and concepts. This thorough, detailed curriculum begins with the basics and advances to complex concepts. Through partnerships with key industry leaders and leading educators, Amatrol developed the right balance of knowledge to train learners to work in their chosen field. A sample copy of the Ultrasonic Liquid Level Student Reference Guide is also included with the system for your evaluation. Sourced from the system’s multimedia curriculum, the Student Reference Guide takes the entire series’ technical content contained in the learning objectives and combines them into one perfectly-bound book. Student Reference Guides supplement this course by providing a condensed, inexpensive reference tool that learners will find invaluable once they finish their training making it the perfect course takeaway.